A double-cut and six albums from the former Beatles member could be yours! 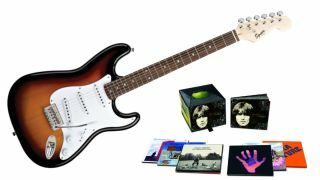 To celebrate the release of the new George Harrison The Apple Years 1968-75 boxset, we have an almighty prize to give away for Harrison fans and aspiring guitarists alike. First up is a Squier Bullet Strat, packed with three single coils, basswood body and vintage Synchronized vibrato. The lucky winner will also get their hands on The Apple Years 1968-75 boxset, which includes remastered versions of Harrison's first six solo albums - Wonderwall Music, Electronic Sound, All Things Must Pass, Living In The Material World, Dark Horse, and Extra Texture (Read All About It) - plus an exclusive DVD. The Apple Years 1968-75 is out now - check out the official George Harrison website for more info.